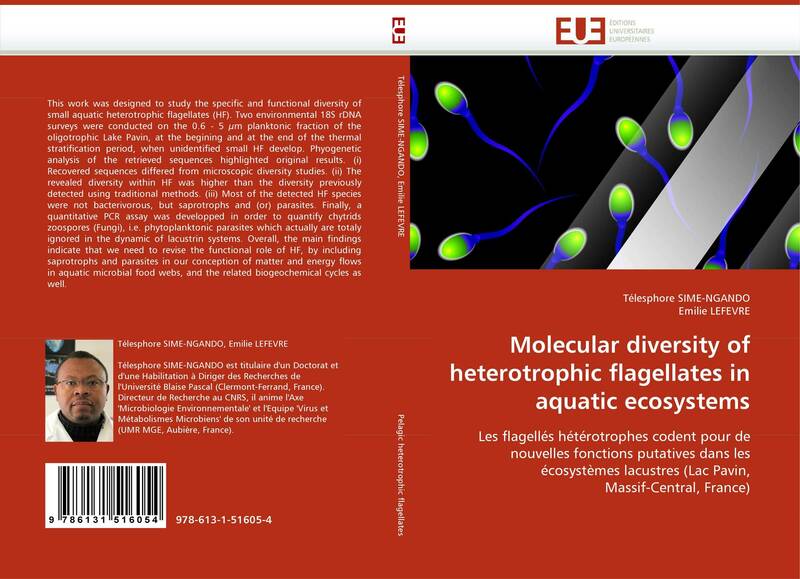 This work was designed to study the specific and functional diversity of small aquatic heterotrophic flagellates (HF). Two environmental 18S rDNA surveys were conducted on the 0.6 - 5 µm planktonic fraction of the oligotrophic Lake Pavin, at the begining and at the end of the thermal stratification period, when unidentified small HF develop. Phyogenetic analysis of the retrieved sequences highlighted original results. (i) Recovered sequences differed from microscopic diversity studies. (ii) The revealed diversity within HF was higher than the diversity previously detected using traditional methods. (iii) Most of the detected HF species were not bacterivorous, but saprotrophs and (or) parasites. Finally, a quantitative PCR assay was developped in order to quantify chytrids zoospores (Fungi), i.e. phytoplanktonic parasites which actually are totaly ignored in the dynamic of lacustrin systems. Overall, the main findings indicate that we need to revise the functional role of HF, by including saprotrophs and parasites in our conception of matter and energy flows in aquatic microbial food webs, and the related biogeochemical cycles as well.